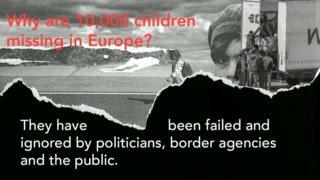 Europol, the EU's police intelligence unit, estimates that around 10,000 unaccompanied children have gone missing in Europe over the past two years. The BBC World Service Inquiry programme asks why so many have disappeared. "There are different reasons [children] arrive unaccompanied," according to Delphine Moralis, secretary general of Missing Children Europe. "Some of them have been sent by their parents hoping that their child would have a better chance at life, some of these children have been separated from their parents by smugglers as a way of controlling them, and some would have lost their parents in the chaos." 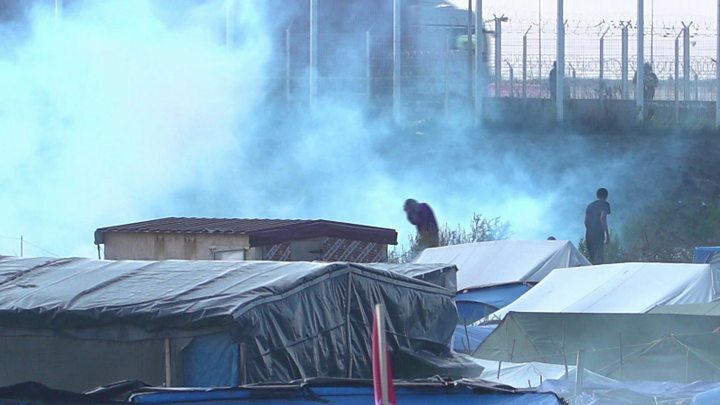 Image caption Charities estimate there are about 1,000 unaccompanied children in the Calais "Jungle"
So what's happened to all these missing children? To put it simply, no-one really knows. That's because when a child from Syria, Afghanistan or Eritrea goes missing in Greece or Italy, nothing much happens. Few border agencies file a missing person's report. "Smugglers are exploiting the children that they bring into Europe," said Delphine Moralis. "The problem is that these children often turn to the people who got them into Europe, rather than to the authorities and that makes them vulnerable." "The boat broke down," he said. "This was the first time I'd seen the sea. I was terrified. I said to God, 'I don't want to die here. Not here in the Mediterranean. My Mum will never know whether I'm dead or alive'." Minutes before the boat sank, the coastguard found them and took them to Greece. Gulwali was handed over to the police, then the army. His fingerprints were taken and then he was given the devastating news: he'd have to leave within a month or be deported. "We'd walk through the railway lines so the police wouldn't see us," he said. "We kept a very low profile." Other children he knew went further to avoid being caught. They burnt their fingertips or cut them off entirely so that if they were found, they couldn't be identified and sent back home. But for every one who makes it, there are thousands who never get to this point. Like Gulwali, they feel safer disappearing than going through Europe's asylum system. Ciara Smyth testified as an expert witness before the House of Lords EU Home Affairs Committee on the situation of unaccompanied minors in the EU. She also teaches law at the National University of Ireland Galway. She says the asylum system as it's set out in law does protect children, but that the laws aren't always followed. "There are a number of EU agencies in hot spot areas in Italy and Greece that are supposed to identify asylum seekers, but they're turning into detention centres," she said. "When unaccompanied minors fester in camps, they're not going to tolerate that forever." And it's not only in Greece or Italy that children are struggling to enter the asylum system. Ciara Smyth says there's evidence that some European countries actively discourage children from applying for asylum because they want them to move on somewhere else. "Many countries along the transit route to northern Europe adopt a 'wave through' approach where they're turning a blind eye to unaccompanied minors," she said. "They're not registering them. They're effectively encouraging them to keep going." And they keep going because, like Gulwani, they're often looking for family members. And here, too, there's a gap between what should happen and what is happening. Remember, these children are often completely on their own. And when their asylum claims are being processed, they often have to undergo humiliating physical tests - teeth X-rays, head measurements or bone density exams to check they're not lying about their age. Then they have to explain why they left home. They'll be interviewed repeatedly and asked to recount, in intricate detail, the traumas they've escaped from. "Very often unaccompanied minors might not have a very clear recollection of events," she says. "It's very difficult for them to give a linear narrative. Successful asylum claims are all about being able to present a coherent story." At that point, more children disappear. So why isn't more being done to support these vulnerable children? Last year, almost 90,000 unaccompanied children arrived in Europe. That's a huge number. Clearly, even if every EU state devoted more attention and resources to the problem, child migrants and refugees would continue to slip through the net. Looking after children who are already within the asylum system has placed a huge strain on local authorities, at a time when budgets are already under pressure. One year on and many of those promises have been broken. Yet there's been little public outcry. Why? It's partly about economics. As austerity bites across Europe, people feel less inclined to help outsiders. And the alleged connection between migrants and militants hasn't helped. Without popular support, politicians are less inclined to take action and enforce the rules that exist to protect children. So the story of the 10,000 missing children tells a much broader one about failure: the failure of border authorities to follow laws which exist to protect children and the failure of Europeans - moved by that photograph of Alan Kurdi - to continue to care for long enough to persuade political leaders to keep the promises they made.